The United States Congress designated the Gaylord Nelson Wilderness (map) in 2004 and it now has a total of 33,500 acres. All of this wilderness is located in Wisconsin and is managed by the National Park Service. In 2004, 80% of the land area of Wisconsin's Apostle Islands National Lakeshore was designated as federally protected wilderness. The new wilderness area - Wisconsin's largest by far - honors former Wisconsin Governor, U.S. Senator, and founder of Earth Day, Gaylord Nelson. 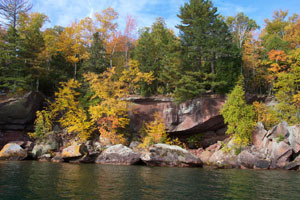 Although many of the 22 Apostle Islands were logged, farmed, or quarried in the late-19th and early-20th centuries, most of them (21 of the 22 are included in Apostle Islands National Lakeshore) are currently wild and primitive. Hidden within the forests, however, are occassional signs of the islands' human past -- encouraging reminders of the regenerative powers of nature. The waters of Lake Superior within the National Lakeshore are not included in the wilderness area, nor are the lighthouses or other existing developed areas of the park. Sand, Basswood, and Long Islands were kept out of the wilderness boundary in their entirety, along with the park's 12-mile mainland strip. The beauty of the islands is enhanced by the area’s geology. Colorful precambrian sandstone have eroded into interesting cliff formations, including sea caves, and there is a highly diverse collection of sandscapes, including sandspits, cuspate forelands, tombolos, a barrier spit, and numerous beaches. These sandscapes are among the most pristine left in the Great Lakes region. The lakeshore is at the continental northwestern limits of the hemlock-white-pine-northern hardwood forest and also contains elements of the boreal forest. Wildlife species are characteristic of the southern limits of the boreal and northern limits of the hardwood/hemlock forests. Game species include whitetail deer, black bear, snowshoe hare, waterfowl, woodcock, and ruffed grouse. Other fur-bearers include the red fox, coyote, beaver and otter. Small mammals are an important component of the lakeshore's terrestrial fauna and include: shrews, mice, voles, red squirrels and chipmunks. Planning to Visit the Gaylord Nelson Wilderness? How to follow the seven standard Leave No Trace principles differs in different parts of the country (desert vs. Rocky Mountains). Click on any of the principles listed below to learn more about how they apply in the Gaylord Nelson Wilderness.